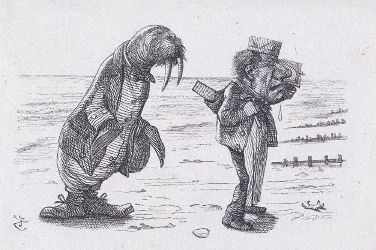 This page attempts to record what is known about paperfolding in the works of Charles Dodgson (aka Lewis Carrol) and John Tenniel.Please contact me if you know any of this information is incorrect or if you have any other information that should be added. Thank you. In 1972 the British Origami Society issued Pamphlet No 1 'Some Notes on the History of Origami' which was written by John Smith. In August 1973 a revised version was issued which included some additional notes on Lewis Carroll's paper folding. On his website 'Bits of Smith', John Smith also gives another reference from 'The Magic of Lewis Carroll', edited by John Fisher, Nelson, 1973, in which he quotes a further passage from Lewis Carroll's diaries which reads. "We were playing on the fort at Margate, and a gentleman on a seat near asked us if we could make a paper boat, with a seat at each end and a basket in the middle for fish." This sounds like a description of either the Chinese Junk or the Gondola. 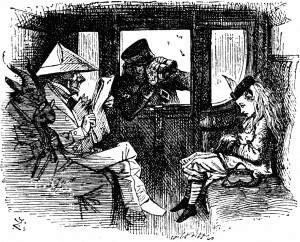 No date for this incident is given, however, this description suggests that the folded paper fishing boats referred to on several other occasions in Lewis Carroll's diaries might have been Chinese Junks or Gondolas rather than, as I had always previously assumed, the much simpler paper boat design made from the newspaper hat. The other design mentioned in these excerpts, the paper pistol, is harder to identify. It may be what we now call the paper banger, or it may be the two-piece pistol made from rolled sheets of paper, or something else entirely. There is simply no evidence to tell us.